Voodoo Tactical Deluxe Professional Special OPS Field Medical Pack FREE SHIPPING! The Deluxe Professional Special OPS Field Medical Pack from Voodoo Tactical is designed to meet the needs of medical and mountain rescue professionals. Its durable, pack cloth material can stand up to the toughest outdoor conditions and daily wear from the field. The padded back, adjustable shoulder straps and waist belt allow for comfortable carry that evenly distributes weight. Loops at the base accommodate attachment of bedrolls or additional bags and the incorporated metal drain holes allow liquid to escape. The custom-designed interior is hydration compatible and provides rapid access to gear by allowing all of the panels to layout flat, and its large number of pockets and straps allow for convenient organization. A pair of large, removable carry bags are perfect for carrying masks, tubes and resuscitation kits. The Special OPS Medical Pack includes an ID window and a hook and loop panel for department patches. 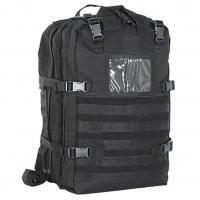 Dimensions (L x W x H): 13" x 8" x 21"
©2002-2019 CopsPlus.com: Voodoo Tactical Deluxe Professional Special OPS Field Medical Pack FREE SHIPPING!